Sen. Bernie Sanders (I., Vt.) is facing rebuke from progressive activists and the far left of the Democratic Party for declining to call for the abolishment of U.S. Immigration and Customs Enforcement (ICE). Earlier this week during an appearance on CNN's "State of the Union" with Jake Tapper, Sanders was asked whether he supported abolishing ICE, the federal agency responsible for preventing cross-border crime and illegal immigration. The senator was conspicuously ambiguous in his answer, refusing to call for abolition and expressing general support for "a national program" to "deal with immigration in a rational way." "I think that what we need is to create policies which deal with immigration in a rational way," Sanders said. "What we need is Trump to sit down with members of Congress and work on a national program which deals with this serious issue." Sanders' views did not seem to sit well with a younger generation of progressive activists and liberals, who are increasingly in favor of unmitigated restrictions on immigration. Jeremey Scahill, a journalist who alongside Glen Greenwald founded The Intercept—a liberal-leaning online publication—in 2014, perhaps best summed up the growing sentiment on the left. The journalist took to social media shortly after the interview was broadcast to lambast the 76-year-old senator for having chosen to stand on the "wrong side of history." "Then Sanders is choosing to be on the wrong side of history on this issue," Scahill tweeted. "ICE was created under Bush-Cheney and has done what they wanted it to do, particularly under Trump. It can’t be reformed." Sanders' aversion to abolishing ICE triggered similar rebuke from other journalists and outlets on the left, with some even denouncing the self-described Democratic socialist as a "neoliberal," a term generally reserved for those who favor free-market capitalism above all else, and as a "moderate." bernie sanders is wrong for not calling to abolish ice. Sanders' deviation from progressive orthodoxy on abolishing ICE underscores the senator's long-held views on immigration, which hampered his 2016 presidential campaign. The senator has generally been supportive of extending the Obama-era Deferred Childhood Arrivals (DACA) program, which granted legal protections to nearly 800,000 illegal immigrants brought to the U.S. as children, and a pathway to citizenship. Sanders, however, has also expressed support for decreasing immigration overall, arguing that "bringing in significant numbers of unskilled" migrants only serves to "depress wages" for American workers. His voting record has generally been in line with such sentiments. In 2007, Sanders voted against an immigration reform measure championed by the late Sen. Ted Kennedy (D., Mass.) on the grounds that the legislation would increase the number of guest workers allowed to come and remain in the country. 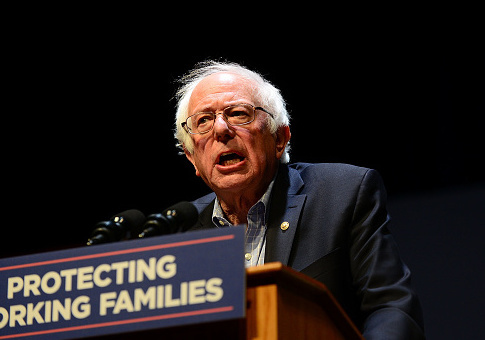 In 2013, Sanders voted in favor of the "Gang of Eight" immigration reform proposal, which would have created a pathway for illegal immigrants to gain legal status and eventually citizenship. The bill also beefed up border security by adding up to 40,000 new border patrol agents and building 700 miles of supplementary fencing to prevent illegal crossings. The legislation, which passed the Senate but ultimately failed to receive consideration in the House, would have also ended the diversity visa lottery system. This entry was posted in Politics and tagged 2016 Election, Bernie Sanders, DACA, Democratic Party, ICE, Illegal Immigration, Immigration, Immigration Reform, Progressive Movement. Bookmark the permalink.